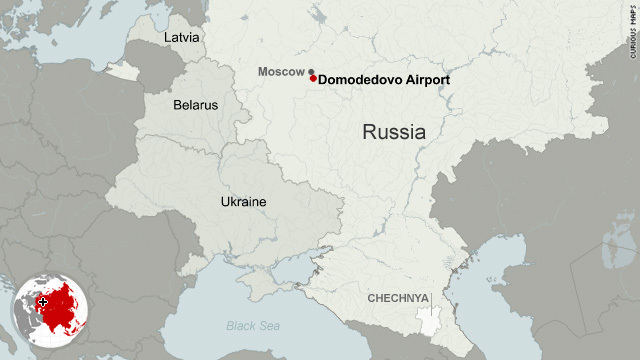 Who planted the Russian airport bomb? Share your iReport photos and video with CNN. Please don't do anything that could put you at risk. 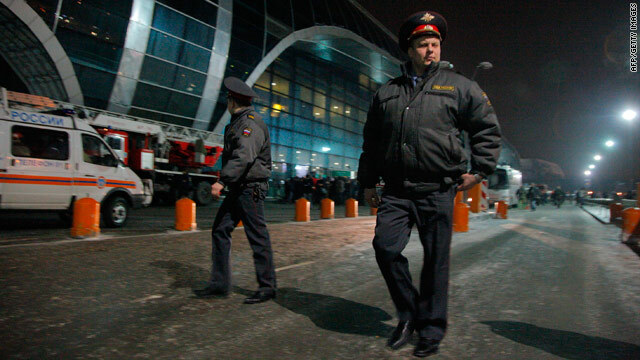 Moscow (CNN) -- A suicide bomber attacked Moscow's busiest airport on Monday, killing 35 people and wounding about 100, authorities and state television said. The blast occurred around 4:30 p.m. at the entrance of the international arrivals section of Domodedovo Airport, the Itar-Tass news agency reported, citing a spokeswoman for the Russian Investigative Committee, Tatyana Morozova. State TV aired video of the smoke-filled terminal, including what looked like bodies and luggage on the ground. Russian President Dmitry Medvedev called the bombing a terrorist attack and immediately ordered additional security at airports and transportation hubs around the country. 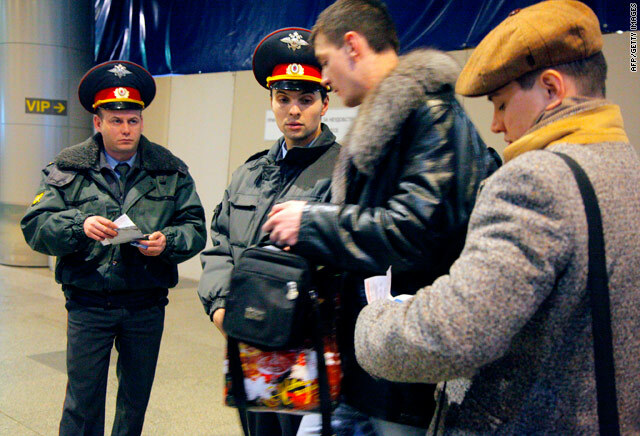 Moscow police went on high alert in case of additional attacks. Where does airport blast leave security? Russian Health Minister Tatyana Golikova said 35 people died in the blast and 93 people were hospitalized. Forty-one of those injured are in serious or critical condition, she said. Some people were given care outside of the hospital, while others were treated for hearing loss, fractures and smoke inhalation. Earlier, the Russian National Anti-Terrorist Committee had said 35 people died and 152 were wounded in the explosion. A heavy police presence remained outside the airport hours after the explosion, and more than 10 ambulances left the scene with lights flashing and sirens screeching. Domodedovo is 22 kilometers (14 miles) southeast of Moscow. According to the airport's website, it is the largest of Moscow's three airports, as well as the busiest in terms of passenger traffic. It was not immediately clear who was responsible for Monday's blast, though previous terror attacks in Russia have been blamed on militants from the North Caucasus region. In 2004, two airplanes that took off from Domodedovo exploded, killing at least 89 people in an attack linked to Chechen suicide bombers. An explosive device derailed an express train in November 2009, killing at least 26 people. Chechen rebels were blamed again. In March of last year, female suicide bombers linked to the group were accused of attacking subway stations in central Moscow during rush hour, killing some 38 people. Golikova said Monday's blast and its aftermath were similar to previous attacks. "This (character of injuries) is very similar to terror acts that we've seen recently. The types of wounds and the condition of the injured as well as what they communicate -- all this is very typical for those kinds of terrorist act situations, unfortunately," she said. Elina Bakhtina told state TV she was at the airport cafe she owns when the explosion occurred. "The blast must have been very strong, because our cafe is about 100 meters from the arrivals area. When we heard the blast, glass just started falling from the ceiling," she said. Tatyana Papova, who was waiting at passport control when the explosion occurred, told state TV that escalators stopped working at the baggage claim area and airport employees started breaking down walls to help clear people from the area. Incoming flights scheduled to land at Domodedovo were being diverted to Moscow's other airports, Sheremetyevo and Vnukovo, Russian TV said. However, airport spokeswoman Yelena Galanova told Russian state TV that the airport was "operating as usual." An airport employee, Andrei Surkov, told CNN that while the international arrivals area was closed, international passengers were being routed through the domestic terminal located on the other end of the airport. Lufthansa spokeswoman Claudia Lange said the airline has suspended all flights to Domodedovo until further notice. Members of the international community immediately offered their condolences and condemned the violence. U.S. President Barack Obama called the bombing a "premeditated attack against innocent civilians." British Foreign Secretary William Hague said British officials are "in urgent contact with Russian authorities to establish the facts and to provide consular support to any British nationals who may have been affected." According to preliminary information from Russian investigators, two British citizens were killed in the blast. NATO Secretary General Anders Fogh Rasmussen condemned the attack and urged greater cooperation in the fight against terrorism, while German, French and Israeli leaders also offered their condolences. Will Geddes, terrorism expert and managing director of International Corporate Protection Group, called the bombing a "very significant terror strike." "To strike in the airport -- which is fundamentally believed and understood by many to be one of the most secure types of installations in a city or in a country -- to have such a devastating attack with such a tragic result, means that they had planned this considerably well and gone ahead in achieving their aims," he said.